This article looks at the following common behaviour problems in dogs and offers an insight as to how and where to get started. It would be a mammoth task to address every aspect of dog behaviour in a single article, but I’m keen to outline the most common ones and to offer some preliminary advice here. Should you find yourself struggling with any of these dog behaviours, I advise you to contact me directly so I can best direct you to a professional practitioner in your area. The best way to address the potential for unwanted behaviour in your dog is to make a careful decision on the best breed, size and temperament of dog for you and your family. Then, assuming you have a dog that is in keeping with your ability to control and relate to (not all dogs are equal, some are for the more experienced), you should be set for an enjoyable future together. By setting good standards in the puppy period you address the whole subject of behaviour problems in dogs from the perspective of prevention rather than cure and that’s always a lot less painful. Not all dogs are owned from puppyhood of course, and many people actively seek to take on a rescue dog, which remains a very valuable and rewarding route to take. Dogs can find themselves in rescue centres for a variety of reasons, but it is common for them to be there as the previous owner was unable to cope with some aspect of their behaviour, so do be sure to drill down to the exact nature of the dog’s behaviour problems before taking it on. To reassure you, there is never a need to shout or become heavy-handed (though I appreciate some problems can be highly frustrating) when looking to overcome any problem you might have with your dog. A calm, composed approach is far more successful. Combine this with well thought out professional advice and you should make progress. Dog-to-dog aggression is the most common form of aggression that I encounter. This can range from barking at other dogs in public to making direct efforts to approach another dog and attack it. The size of the dog displaying such behaviour has a big impact on how well you can physically manage a dog displaying such behaviour, along with other owner’s reactions towards you and your dog. Other areas of aggressive behaviour include the protection of resources, such as food, toys, bones, beds, vehicles once inside, and even the owner. Less common than dog-to-dog aggression is aggression towards people. This can take the form of aggression towards the owner or family members, to visitors to the home, or people when out in public. For obvious reasons aggression to people poses a greater concern due to not just the harm that may come to others, but the risk the owner runs of being prosecuted under the Dangerous Dogs Act, and the prospect of a destruction order upon the dog. Depending upon the severity of your dog’s aggressive behaviour, it is wise to introduce a muzzle to your dog to ensure the safety of other dogs, people and yourself. Once your dog is safe in this way, you can begin to address the behaviour and gain extra confidence that there will be no biting in the process. Introduce the muzzle gradually to your dog by starting in the home. Place treats in the muzzle, and over successive sessions, you should be able to hold the muzzle on your dog for longer periods until you will be able to fasten it. This may take a week; some dogs will accept it immediately without fuss. All of the above require very careful handling to ensure that the dog is dealt with in a safe and humane way. The main reason for these various aggressive behaviours is often due to a lack of socialisation, especially when it comes to aggression with other dogs and people. There may also be breeding/genetic factors to consider. Abuse or poor handling by humans, and attacks from other dogs can also result in a fear-based reaction from your dog. This highlights again the importance of adequate control when your dog is at a puppy stage; to help ensure it is safe with other dogs that may at first be unknown in their behaviour and preventing your young dog from barreling into situations that could be beyond your control when you don’t have a recall or a long line in place to safely manage your young dog. It is rare for a dog to simply grow out of such behaviour, so I advise you to seek professional advice early. You can contact me directly as I work mostly with aggressive dog behaviours, or if you are beyond my travel zone I shall refer you to someone that can help. The best time to address the recall is when your dog is young and much easier to influence and control via the use of reward-based techniques such as long training lines (30-50’), food, toys and whistles, especially when combined with open body language and bright voices. Some working breeds are hard-wired to hunt (think Spaniels, Terriers and Hunt-Point-Retrieve breeds for example), and if this instinct is allowed to become too prominent, will make it very hard to regain control of your dog once it is let off the lead. This is why I encourage puppy owners to use long training lines until the dog is showing all the signs of a reliable recall under all distractions and circumstances. As with all dog behaviour problems, there are various degrees of severity that might be seen in the dog. As a result, the measures that one might take to overcome these problems can vary from making small adjustments to more dramatic steps to ensure a successful outcome. Some dogs that are not recalling reliably when distracted may well improve when you introduce a dog whistle and the offering of some cooked liver or chicken on its return. Take time to find a reward food that your dog is driven to return for. Some dogs will be more driven to receive a play with its favourite ball on a rope toy for a few seconds when returning, so it’s not always all about food. However, in my experience food will do the trick for most dogs. In any event, this is all about finding the motivation for your dog to return. An important element on finding motivation is your own tone of voice and body language. As well as the motivation you will also need the means to enforce the recall once you issue it. Some dogs simply become accustomed to not obeying your recall, and thus in effect ‘tune you out’ when they are busy hunting or playing with other dogs. The simplest way to create a near fail-safe means of enforcing the recall is to use a training line. These can be purchased online, or you can make your own long line up using a suitable fabric line and end clips for a larger DIY store. Combine the use of a long line, a genuinely enthusiastic effort from you with your voice and body language, and offer food/toy once the dog is with you. Repeat this as long as is needed over what may be weeks if not months, until you feel confident you are seeing a good response. Test the recall by letting the dog loose in a secure area whilst you continue to issue your recall commands. Another way to make this transition is by gradually shortening the training line over a couple of weeks until it can be removed completely and your dog is showing a reliable recall. Dogs are prone to jumping up, as they want to be near your face where your voice and facial expressions are given. It is relatively easy to address this during puppyhood, but we may have a more serious problem with older, bigger dogs. A large dog jumping upon the owner may be unwanted, but doing this in public to a young child or elderly person may put them in fear, knock them over, and may then be seen as an aggressive act by the member of public leading to a prosecution if reported. The best time to address jumping up is during puppyhood. If a puppy jumps up and it’s received with an affectionate hand, the puppy will continue with such behaviour. The simplest rule to request any dog before giving affection is to ask for the sit position before any attention is given. If all members of the family are consistent in this rule you will see your dog coming and sitting at your feet to ask for attention, rather than to jump up for it. Very young dogs can be discouraged from jumping up on a person by quickly turning away from the dog and walking away as this ignoring can be effective at this age. Stopping an older dog from jumping up is not so straightforward as they will often continue with the behaviour even if the dog is ignored! Determined jumping up carried out by a large, older dog may require professional help. Remember, that dogs only perpetuate the behaviours it feels there is a benefit in doing. So it stands to reason that if such efforts are never indulged and the dog finds itself briefly ignored, the behaviour will usually fade and eventually stop. Once we show the dog how to gain attention (always sit first) we have a new behaviour that is far more acceptable and polite both in and out of the home. Ensure your greetings with your dog are calm and free from excitement. A calm approach by you is far more likely to create a well-mannered and calm dog that is less likely to jump at you or others as a result. Should your dog be likely to jump up at a particular family member or visitors to the home, the use of a regular soft lead can be very useful. The lead will allow you to check unwanted jumping and to keep the dog back and away from the person until calm arrives. Calm behaviour can be reinforced with a treat and affection once all four feet are on the floor. As with many aspects of dog training, consistency is absolutely key. Some dogs can be late to become fully house trained for a variety of reasons and by returning to some basic methods to encourage being clean in the home will usually work. Another reason for toileting in the home may be related to issues such as separation anxiety, whereby a lack of bowel and bladder control is a result of the dog’s distressed state. Some detective work with a behaviourist can help you establish the base cause for such behaviour, enabling you to put in place the correct measures. The simple routine for puppies involves regular (hourly or so) visits to the garden on a lead to a chosen spot. Use a keyword such as ‘Hurry up’, or ‘Be clean’ to encourage the actions, and then reward right there with a little treat and some fuss. I believe that many late developers on the toileting front are as a result of a lack of vigilance during the dog’s younger months. Leaving open doors assuming that the dog will know where to go (i.e. outside), is also another reason for dogs relieving themselves in the home. By taking control of your dog and placing an emphasis upon what you do want is the key to success. This can be applied to dogs of all ages. I am not a fan of toilet pads for indoor use. This creates the habit of going indoors, which in the long run you will only have to undo at a later stage. When cleaning up accidents, be sure not to scold, as this can create confusion on the dog’s part. Again, focus on what you do want in terms of the location, and reward it there to show your approval. There are various odour removers on the market that can help remove the dog’s scent from an area your dog may be using and this can help. Some entire male dogs may be marking in the home inappropriately. Castration in some circumstances may all but cure this. Please discuss this with your vet and behaviourist to help you come to the best course of action. When you are absent from your dog, the use of a crate can prove invaluable to ensure that your dog does not soil in the home. A crate should be introduced gradually if you have not used one before. This will ensure that your dog is relaxed and happy once inside. Dogs are much less likely to soil the space they occupy to sleep in. If your dog is soiling due to anxiety, a crate is less likely to help and you will need to seek the advice of a professional to overcome this in other ways. The next section looks at separation anxiety in more detail. This is a behaviour that can be either mild, that involves a little whining when you leave the dog, or to the point that the dog becomes frantic with distress, and may cause damage in the home, self-mutilate, howl or soil in your absence. It is likely that the dog will also be very vocal by crying and barking in your absence. More serious cases can have a huge impact upon the owner and the way they have to run their lives around the dog, due to other complications such as noise complaints from neighbours. Some owners may even be alerted to the fact that the dog is suffering due to a noise complaint from nearby residents. Serious cases of separation anxiety require an experienced behaviourist that is able to work closely with both the dog and family to ensure a swift and lasting outcome. Cases of separation anxiety often involve the need to address the relationship between dog and owner. I usually find that the relationship is what might be termed ‘over-bonded’ and that the owner has not created sufficient independence in the dog from an early age. As a result, the dog is less able to cope when left alone for either short or longer periods. The implementation of fair and balanced rules and limits for the dog to follow is often key to preventing this behaviour from arising in the first place, and the same thing needs to happen to overcome it if the problem already exists. Overcoming this behaviour problem involves showing the dog that being left alone is ok, and a normal part of life. Areas to consider when seeking to reduce such anxiety lies in a few areas. In particular, it is not the departure that makes so much difference, but the way you return to your dog. Excessive greetings and attention when you come home can leave a dog distressed when left alone. Do be sure to ignore your dog until it is calm. Then you can call it over, ask it to sit and then give gentle attention. I call this a ‘deferred greeting’. 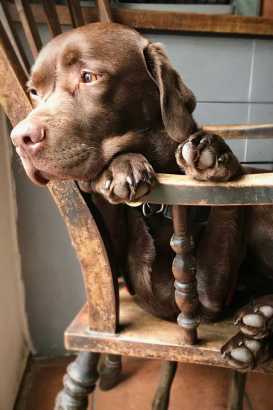 Dogs that suffer from separation anxiety are often given unlimited fuss and attention on the dog’s terms. This can create a dog that is essentially ‘addicted’ to such interaction and is as a result unable to settle down in your absence. Do be sure to ignore the dog should it be seeking your attention. By all means, interact with your dog and give it the love and interaction it deserves, but this should be strictly on your terms. Creating positive distractions with a dog that is stressed when left can be a highly effective way to overcome such behaviour. The offering of stuffed Kongs can make a significant improvement over time. Placing the dog’s food inside the Kong can do this, and then the Kongs can be given over about six meals per day depending on your availability to do so. Make a firm mash with dried food (allow to soak overnight in hot water) and then add extra goodies to stuff into the Kong. Leave the dog alone for each meal and then return (quietly) after 5-10 minutes to release the dog out of the chosen room. A kitchen is often a good place for this. Once your dog is coping with this routine you can begin to extend the time the dog is left alone. Make all extensions gradual to ensure steady progress. Adaptil diffusers or collars can help to address such anxiety, and these can be bought from your vet or pet store. Finally, once your dog is coping with brief periods alone and you are beginning to extend them, you can practice the routine of leaving the home. This involves getting ready to leave as you would normally, but to ignore your dog in the process. Leave the home and then re-enter after a minute. Totally ignore your dog to demonstrate that there is no problem or excitability with you leaving and returning. As your dog improves, you can begin to extend the periods the dog is left alone. The giving of a Kong can continue to be used as and when the dog is left alone. Make slow and gradual steps forward, keeping a note of your progress as you go can show you that you are moving forward and that your efforts are worthwhile! A quick final word/tip on this subject. A well-exercised dog is often a tired dog, so aim to carry out your leaving routines once your dog has settled after a good run!